A common refrain in usability is to support expert users. This often boils down to giving users shortcuts for common tasks: one of my personal favourites on the web is Amazon’s ‘One Click’ button that allows you to purchase a book with just, well, one click. Within desktop applications, expert users are much better supported with tools like keyboard accelerators. 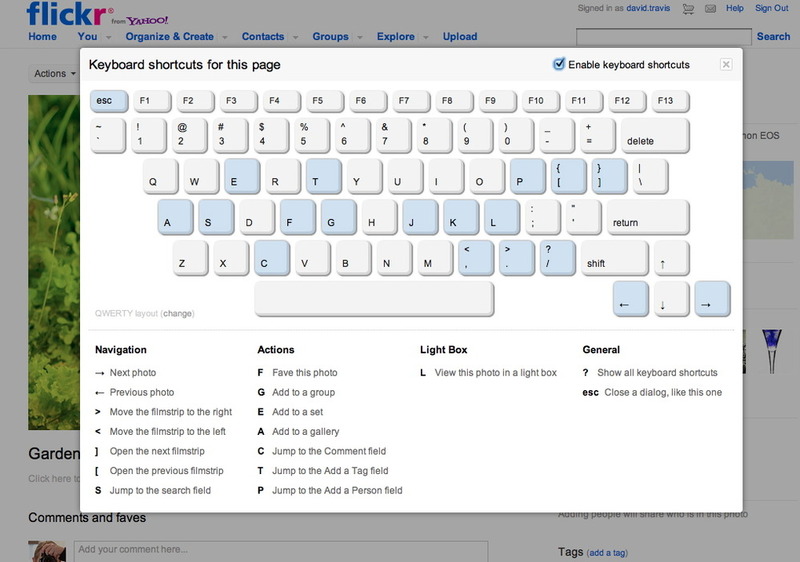 Curiously, very few web sites appear to support keyboard shortcuts, but I came across this excellent example at flickr recently. When you want to scan through lots of photos, these shortcuts are a real boon. This entry was posted in fame on September 27, 2011 by dtravisphd.